Previous edition: published as It's elementary! 2007. Want to learn all about chemistry with one of the world's most famous science professors? 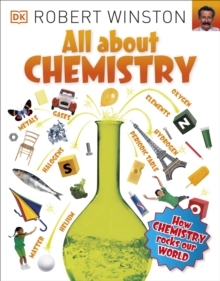 It's elementary, my dear Winston!In All About Chemistry, Robert Winston guides children of all ages through the explosive world of atoms, elements and the periodic table. Learn what the ancients thought about elements (earth, air, fire and water) and discover what the philosopher's stone was really about, before heading into the modern world of hydrogen, oxygen and carbon. Examine what a dog is made from, see how a helium balloon floats, and find out what's on your plate and in your water. With the whole of the periodic table explained and catalogued, and common elements including sodium, gold, and iron explored, this book brings to life what the world is made of.